PC Pumps are also called Positive Displacement Pumps, Progg Cavity Pumps, or simply Cavity Pumps. 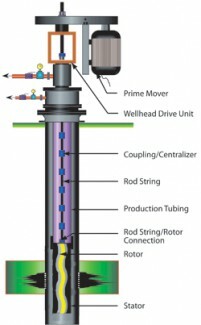 As fluids are fed into the PC Pump, they are expelled at the rate of rotation of the pump. Used in well drilling applications, PC Pumps allow technicians to control the volume of liquids being fed into the borehole. Working closely with a Mud Motor, these pumps are a form of Impeller. They main role is to monitor the rate that liquid is being pumped into a downhole drilling system.